It was cold at morning, about 32 Fahrenheit. A thin ice layer covered all cars. However, there was no ice in my car, because my parking slot is covered. My wife was wearing a black coat, while I dressed my overcoat. I helped her to climb the car (It is an elevated Land Rover) and took my seat. I set up the GPS on my smartphone and hit the road. 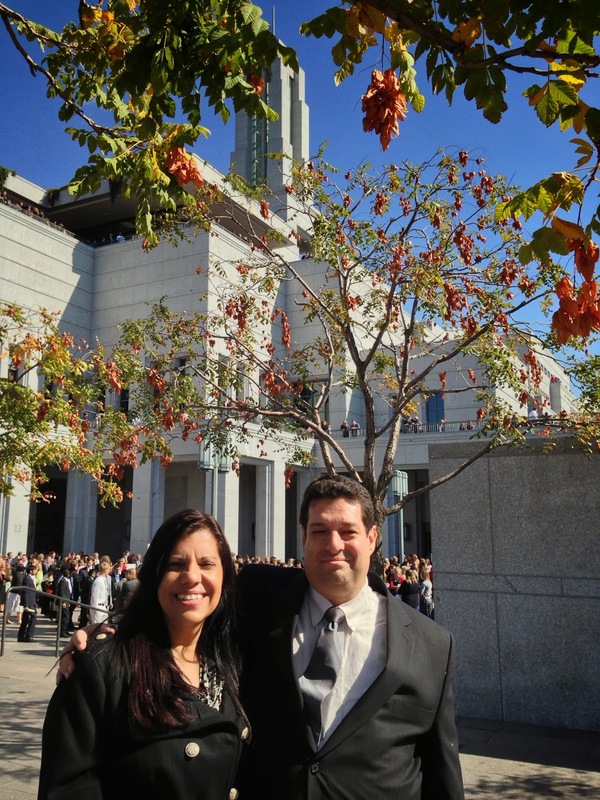 We had been at Conference Center once for just a tour, but that was the first time we went to General Conference of The Church of Jesus Christ of Latter Day Saints. In few minutes, the internal temperature raised confortable 70 Fahrenheit. My wife was so excited! We talked a lot about this wonderful blessing while we ride through the I-15 Highway, watching to the magnificent landscape provide for all white snow covered peaks around us. We arrived early at Salt Lake City, and we parked a few squares from the Conference Center. There were a lot of people walking to the same direction we was, all wearing “Sunday clothes”, and so excited as we was. After few minutes walking, we arrived at Conference Center. At the entrance, a security team received us (a necessity in this dangerous days), and they invited us to walk through a metal detector. As I forgot to remove my phone and my keys out of his pocket, the alarm rang. I removed all my stuffs from the pocket and tried again. No alarm this time. We were conducted to our seats with help of several volunteers acting as greeters. What an amazing place! The perfect acoustics and illumination was the perfect place for the Mormon Tabernacle Choir. In fact, the Choir was finalizing an audition when we arrived, offering a contemplative environment while we were waiting the Conference start. In a few minutes, all seats were taken and a message on two giant screens invited us for a contemplative reverence. Suddenly, the Choir starts singing, indicating the beginning of Conference, who was directed by President Henry B. Eyring. I do not intent to do a complete report of the Conference, but I would like to talk about the experience of being there. I could not say that the Spirit is stronger, or the prophecies are more prophecies there. It is not the case. The speakers are the servants of the Lord, and if we heard his words in the Conference Center or by Internet, it is the same. However, being there makes all these things more real, more concrete. The next time I watch General Conference on TV or the Internet, everything will be more real, because I've been there. It will no only an image projected on a screen, but a real construction of a place where I have been personally. I wish all people could have the same experience. Returning home through I-15, I and my wife talked about all marvelous experiences we had at the Conference, while contemplating the magnificent white snow covered mountains, confidents that our experience enlightened us, but our testimony still the same.